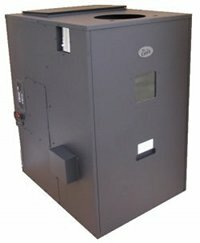 St Croix pellet furnaces are made by Even Temp who are well known for their pellet stoves. These two furnaces have grate systems designed to cope in different ways with high ash fuels. There are two versions of the St Croix furnaces, the SCF-050 and the Revolution. Both can be connected to existing ductwork and used either by themselves or in conjunction with another furnace. Both the SCF-050 and the Revolution are multi-fuel and thermostat compatible. The St Croix pellet furnace SCF-050 employs the St Croix clinker removal system used in their corn stoves. This allows the clinkers to be dropped into the ash pan while maintaining a fire in the burn pot. The SCF-050 has a two speed fan. Low speed provides a quieter flow of warmer air, While the high speed setting gives a larger amount of slightly cooler air. This St Croix pellet furnace has control board diagnostics relating to the high temperature limit, the flame detection system and the state of vacuum in the firebox. Max. Heat Input 15,300 - 45,000 btu. Fuel Type Pellets, Corn, Wheat, Rye, Cherry pits, Distillers grain. Convection Blower Capacity 600 - 800 cfm. Warm Air Outlet Size Round, 10 in. Rectangular, 6 in. by 15 in. Dump ash from the burnpot. 10 - 12 hours on high heat, daily on medium or low. Empty the ash clean-out ports. Remove fuel from the hopper. Follow all cleaning procedures above. This St Croix pellet furnace has a dual hopper system that allows the furnace to ignite using pellets, and then move over to the desired fuel. It has an electronic igniter. The Revolution burn pot is divided into four sections and rotates, allowing automatic emptying of the ash. 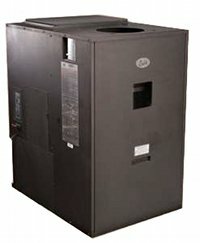 This furnace has control board diagnostics relating to the high temperature limit, the flame detection system and the state of vacuum in the firebox. Heating Area 2,500 sq. ft.
Max. Heat Input 18,000 - 60,000 btu. Convection Blower Capacity 1,000 cfm. Warm Air Outlet Size Round, 10 in. Rectangular, 8 in. by 12 in.